Native plants are those that occur naturally in a region in which they evolved. They are the ecological basis upon which life depends, including birds and people. Without them and the insects that co-evolved with them, local birds cannot survive. For example, research has shown that native oak trees support over 500 species of caterpillars whereas ginkgos, a commonly planted landscape tree from Asia, host only 5 species of caterpillars. When it takes over 6,000 caterpillars to raise one brood of chickadees, that is a significant difference. Many native plants offer beautiful showy flowers, produce abundant colorful fruits and seeds, and brilliant seasonal changes in colors from the pale, thin greens of early spring, to the vibrant yellows and reds of autumn. Lawns and the ubiquitous bark-mulched landscapes are notorious for requiring profuse amounts of artificial fertilizers and synthetic chemical pesticides and herbicides. The traditional suburban lawn, on average, has 10x more chemical pesticides per acre than farmland. By choosing native plants for your landscaping, you are not only helping wildlife, but you are creating a healthier place for yourself, your family, and your community. Landscaping with native plants can combat climate change. In addition to the reduced noise and carbon pollution from lawn mower exhaust, many native plants, especially long-living trees like oaks and maples, are effective at storing the greenhouse gas carbon dioxide. Because native plants are adapted to local environmental conditions, they require far less water, saving time, money, and perhaps the most valuable natural resource, water. In addition to providing vital habitat for birds, many other species of wildlife benefits as well. The colorful array of butterflies and moths, including the iconic monarch, the swallowtails, tortoiseshells, and beautiful blues, are all dependent on very specific native plant species. Native plants provide nectar for pollinators including hummingbirds, native bees, butterflies, moths, and bats. They provide protective shelter for many mammals. The native nuts, seeds, and fruits produced by these plants offer essential foods for all forms of wildlife. This tall sunflower has typical flowers as shown. Leaves can have sawtooth-like edges, or sometimes more entire (smooth). The leaves attach to the stem with a short but distinctive petiole. The stems tend to be smooth and covered with a whitish bloom. Sunflowers provide nectar and pollen to a great variety of insects, plus a hunting ground for spiders, assassin bugs, and other predators of the many insects attracted to the flowers. When the flowers are spent, birds and mammals, including finches and rodents, relish the sunflower seeds. 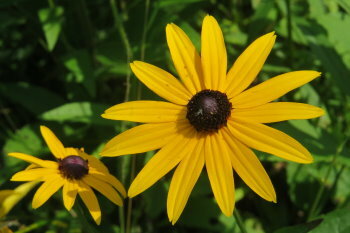 While it prefers moderate moisture, Brown-eyed Susan tolerates most conditions, including drought, once it is established. A short-lived perennial, it self-seeds readily, flowering in its second year. 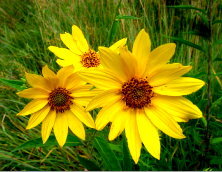 Its abundant bright yellow flowers are flat, one to two inches across, with jet black centers that fade to brown. Blooming from late summer until hard frost, R. triloba reaches two to five feet tall and becomes bushy if not crowded by other plants. It makes an excellent cut flower and complements any of the tall native grasses and common prairie wildflowers. Has an upright and airy appearance. The lobed leaves are attractive and dark green with long petioles (leaf stalks). Foliage is usually healthy since leaves contain a chemical that repels insects and mammalian browsers. 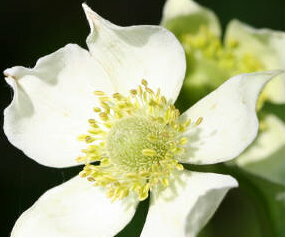 Flowers are solitary with 5 white petal-like sepals and numerous greenish stamens. Blooms are very showy in spring and early summer. When in full bloom, flowers are reminiscent of tiny white poppies. After the white sepals fall, a green thimble-like fruit cluster remains. It is about an inch long and remains green for a while before turning into a fluffy mass of seeds. Useful as a mass or groundcover in shade gardens or other moist partly sunny or shaded sites. Wild ginger is a native, spring wildflower that makes a lovely groundcover with its satiny, heart-shaped leaves. Pollinated by ants, its unique purplish brown flowers appear beneath the leaves in spring. Flowers are quite attractive on close inspection, but are usually hidden from view by the foliage. The leaves of Wild Ginger have a spicy fragrance when crushed, but shouldn't be eaten. The roots are edible and can be used as a flavoring like ginger. This species flourishes in wooded areas with light shade and moist to slightly dry conditions. 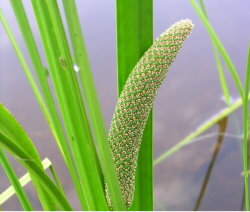 ​At first glance, a colony of Sweet Flag may resemble cattail (Typha spp.) or Blue Flag Iris (Iris versicolor); however, its bright green, sword-shaped leaves bearing a greenish-yellow, finger-like structure set it apart from all others. Most notably, Sweet Flag is easily distinguished by the pleasant fragrance given off when the leaves are broken. Sweet flag is of ancient stock - DNA evidence supports Acorus as the oldest surviving line of monocots, perhaps providing paleontologists with a picture of the past. Sweetgrass is extremely easy to grow and likes well-drained soil, and full to part sun. A medicinal herb, Sweetgrass spreads by underground rhizomes, that can be harvested twice a year. This plant has an extensive root system and rarely produces seeds. 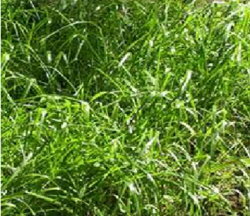 It is shallow-rooted and so grows well with other grasses and shrubs. Sweetgrass is a sacred herb to Native Americans and is burned to attract positive spirits and cleanse an area. The sweet fragrance of this herb intensifies when dried and smoldered and it is also used in many smudging and prayer rituals worldwide. Sweetgrass can also be used to weave baskets, fans and other products by harvesting the long Sweetgrass and laying to dry in the sun. 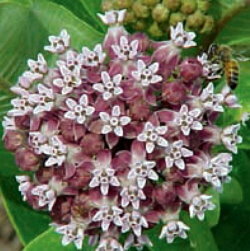 One of the most beautiful of native perennials with clusters of upturned pink flowers in June and July, longer than other milkweeds. Much underused in average garden conditions! Attracts butterflies of all kinds. Willow-like leaves are 4-5" long. Occurs in floodplains and wet meadows. 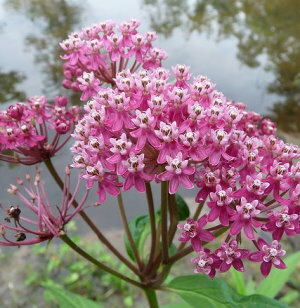 Swamp milkweed, true to its name, prefers consistently moist soil, but performs admirably in average, well-drained gardens as well. Full sun is best and some shade is tolerated, though blooming time and color may suffer. Popular nectar source for monarchs and other pollinators. Great for use in the landscape, excellent winter interest. Beautiful for cuts to create holiday displays. Use in groupings and mass plantings, as perennial or shrub border plants. Good as specimens, screens, or hedges. It tolerates damp soils, and so can be used in bioswales and rain gardens. Adaptable to wet soils, does well in light and heavy soils. Likes high moisture. Native to swampy and boggy areas. Best if pruned in late winter or early spring. No pruning really necessary unless removing dead/broken branches. Fertilize in early spring by applying a slow release fertilizer specialized for trees and shrubs. 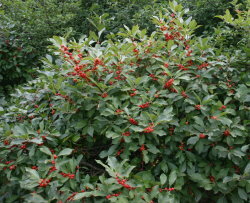 Bright red berries are great for flower arranging! Grows in handsome rounded clumps and forms colonies from short creeping rhizomes and by self-seeding. Foliage greens and initiates growth in early spring before the warm season grasses begin to grow. In late spring multiple rigid upright culms rise above the basal foliage. 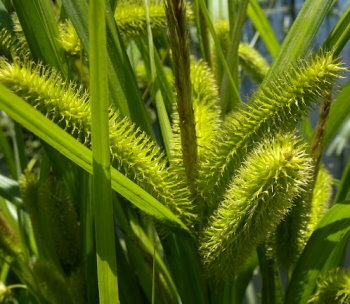 The culms are leafy with numerous glossy blades that are up to 2’ long. The wide spreading leaves are densely arranged on each erect culm giving the appearance of a pinnately compound palm frond. Foliage develops a pleasing yellow fall color. Carex comosa is a large tufted wetland sedge. The narrow leaves are lime green and shiny. In late spring triangular culms rise above the foliage to 5’ bearing large chartreuse bottlebrush shaped spikes. Attractive warm brown seed spikes follow. 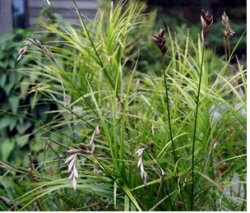 This bold sedge flourishes in sun or part sun in damp or wet sites. Plants prosper in difficult wet mucky soils or even in shallow water. This sedge hosts caterpillars of Eyed Brown Butterflies and several species of Skippers and moths. Many wetland birds feed on the seed. This striking native wildflower is often cultivated for its amazing ability to attract butterflies and bees. 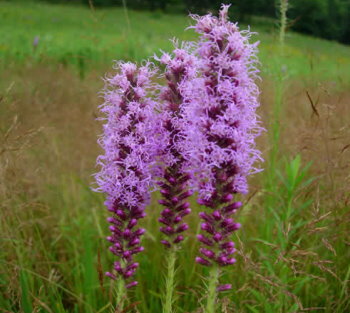 Though the meaning of the Latin genus name Liatris is a mystery, the species name spicata means “spike.” This species is one of the many studied by the German botanist Carl Ludwig Willdenow, who laid the foundations for the scientific study of plant distribution. The roots are eaten by prairie voles. Like most sedges, its most attractive (and most photographed) phase is during its mid-summer fruiting period. Carex vulpinoidea is one of the most abundant and easy-to-grow sedges in a variety of sun and soil conditions. The common name is derived from the seed head which resembles a fox's tail. 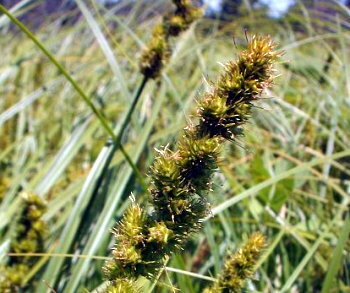 Like most sedges, it actively grows during the spring and fall when soil temperatures are cool. Spotted Joe-Pye Weed is a tall plant, growing up to six feet tall. It has a flat-topped cluster of fuzzy pink or purple flowers and purple stems. There are several species of Joe-Pye weeds, supposedly named after an Indian who used it as a medicine. Spotted Joe-Pye Weed leaves grow up to eight inches long. They are thick and green with teeth on the edges. Between three and five leaves will branch out from the same spot on the plant's stem. This is called a whorl of leaves.Flowers are small, only 1/3 inch wide, but they bloom in large clusters over five inches wide. Spotted Joe-Pye Weed blooms from July to September.